Bars, Restaurants - Are You Full This Afternoon? Bars, Restaurants – Are You Full This Afternoon? Bars, Restaurants – Are You Full Today? We know that most bars and restaurants can pull in the business they are looking for at dinner and on weekends, but are you full mid-week or even mid-day? Do you have all the customers you are looking for during those off times? Sports are one of the biggest draws for Bar and Restaurant customers and DIRECTV has the sports you want on your TVs. Football, Basketball, Baseball, Hockey and Soccer are the biggest spectator sports in the US and they are all on DIRECTV. MLB Playoffs are on Today!! MLB has many of its games during the day and during the week in the regular season. On MLB EXTRA Innings, your customers can watch up to 100 out of market games per week. Right now the MLB Playoffs are going on with the Championship Series. Many of the games have been during the day including the 1st two games of the ALCS between the Toronto Blue Jays and the Cleveland Indians. How many of your baseball fan customers would have loved to take in a game during lunch? The NHL season started on October 12th and you can show your hockey fan customers up to 40 out of market games per week right now! NHL weekday games start as early as 5:00 pm Mountain, so you can be drawing in customers for early dinner to watch the game. DIRECTV is hooking you up with a FREE NHL Center Ice from October 12 to November 2. Give your customers a taste of exciting hockey action in October and keep them coming back all season. Soccer is not only the most popular sport in the world, it is the fastest growing sport in America according to the Wall Street Journal. How many of your customers would love to watch a match between their favorite teams. With international leagues and club matches from Europe, soccer can draw in customers all day. FOX Soccer Plus brings you the best international and club soccer matches, including games from the UEFA Champions League and the Barclays Premier League. From October 15-23, 2016, DIRECTV is offering a FREE preview of Fox Soccer Plus with 15 exciting matches, many during those off times that are hard to draw in customers. College football is in full swing and college basketball is around the corner with most schedules starting in early November. With games every day of the week, you can give your customers many games from their alma mater or favorite team on your TVS. With ESPN College Extra, you can show your college sports customers over 500 exciting live events featuring matchups from top conferences. They will be able to watch college football, basketball, baseball and more throughout the year in your bar or restaurant. The NFL is one of the biggest draws for Bars and Restaurants on Sundays and of course, DIRECTV is the exclusive home of NFL SUNDAY TICKET, the only plays you can get every live out of market game every Sunday. Did you know that you also have Thursday Night Football on CBS and NFL Network? One more way for you to bring in traffic on a weeknight! The NBA is Coming, the NBA is Coming! The NBA preseason games are ongoing and the NBA Regular Season starts October 25th. Give your basketball fan customers the action on the hardwood that they want to see and make them regulars at your bar or restaurant. NBA League Pass brings you up to 40 out of market games per week so you can say “We Have That Game”. DIRECTV knows that creating just the right promotional materials to market the fact that you have these sports available on the TV in your bar or restaurant can be difficult. That is why they created DIRECTV MVP Marketing for their bar and restaurant customers. 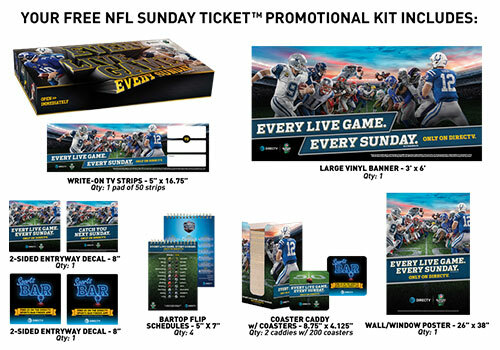 DIRECTV MVP Marketing makes FREE promotional packages available for you for every major package such as NFL SUNDAY TICKET, NHL Center Ice, and NBA League Pass. It also has many other types of marketing materials available and a full schedule of ALL the sporting events that will be shown on DIRECTV. Log into DIRECTVMVP.com for more information about what is available.